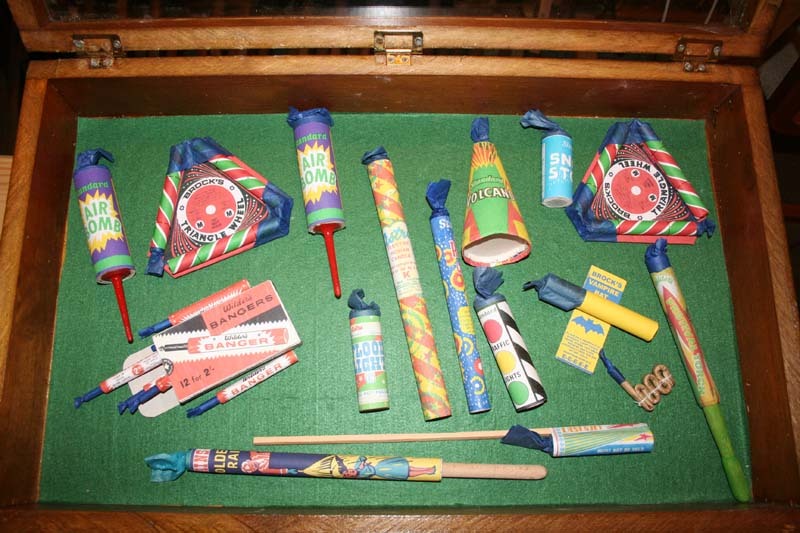 I thought it would be good to have a thread for reproducing some of our (sadly) long gone favourite fireworks, that alot of us grew up with. Standard, Pains, Astra, Brocks etc no longer manufacture the garden fireworks that I would love to see again. I have a modest collection of original vintage items & just the look, feel & smell of them bring back happy memories of foggy autumn evenings! Of course firing these originals is out of the question - so the next best thing - reproducing copies of them to fire! I was inspired by maxman's copy of Standard rockets. The excellent firework museum website, provided the label & technical drawings. I made a copy of the Standard 0.5 ounce rocket which I first used back in the early 70's. Even though this was a copy - it brought back great memories as I went to fire it! Nice to know I'm not the only one with the nostalga bug! Looks superb- just like the original did - I think there was also a similar one with a blue coloured wrapper? I also remember the old standard and astra fireworks fondly - I used to stay up north so we didn't see much of the other brands in the 70's/80's. I recall fondly the year my father came home with a load of fireworks for bonfire night including about half a dozen of those big standard Rockets with the sticks detatched, the sticks were taller than I was at the time. It would be great to replicate the old fireworks, are any of the old formulas known? it would be such a shame if they have been lost. Its good to see high quality replica`s being made,........excellent Rip Rap! Thought peeps might like to see these dummies that I made for the Stanford Hall stand. We also had some real ones (in a sealed case) but I made these so members of the public could handle them. ...and yes, before you ask I have made live versions of most of them! Edited by phildunford, 29 August 2009 - 08:11 PM. Those are beauties! Which ones have you "brought back to life?" Question;- Were those labels printed on your home computer printer? also what paper did you use? I did wonder why the spike was different on the airbombs this explains it. CPF - Yes, they are printed on my home printer. Most come out fine on ordinary 80g copier paper. After all the originals were printed as cheaply as possible. It's a photo quality printer (6 inks) so it can make a pretty good approximation. Most labels I'm aware of used to have a matt finish. I've also used a heavier semi-matt paper (100g) intended for colour copiers which also works well. Rip Rap - I've made pretty good versions of the Roman Candles, Flood Light, hand held Golden Rain, Triangle wheel, Traffic Lights and bangers (and quite a few others that are not in this collection!). Time is the enemy! Graham - Good spot! I did not have a original spike to copy, so this is from memory! It's turned out of wood on the lathe and painted red. Fantastic work on the reproduction fireworks, just goes to show what can be done. I would give it a go but I have little idea how to faithfully reproduce the formulas and techniques for making them, though I did find this formula for a Vesuvius cone I believe by Hardt. I don't know whether this the same as the Standard Mount Vesuvius. It was also said subbing in some red gum in place of part of the sulphur in order to slow the burn rate helps. The amount of alcohol becomes critical. Even a tiny bit too much, and you end up with silver caulking compound. Too little, and the mixture is messy to handle. As ever I will be re-creating some old favorites this year, all Standard with label copies from the 70's 80's and 90's (one’s with the union jack logo). This is my Stash so far, I will be adding a few more fountains some bangers and larger set piece items (morning sunrise ect) over the weekend. Most are exact replica’s size wise and some use original comps although some have been improvised. That is some serious dedication there! Well done to you !